Legend’s 14-passenger Expeditions are an exquisite option for groups of 9-12 people. Covered under a bumper to bumper 100,000-mile manufacturer’s warranty, it is in the QVM warranty that ensures these vehicles to be sturdy, safe, and extremely dependable! The interior features an elaborate and elegant fiber-optic lighting setup, in and around the bar and ceiling. The ceiling, the back plate of the bar, and the partition are covered in a mirror/twilight backing that is very romantic. 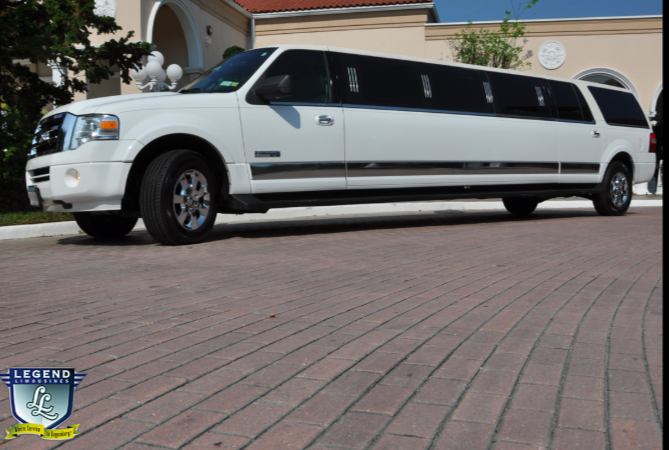 Amenities include an elegant wood bar, two 15″ flat screen TV’s in the center of the vehicle, and a 15″ flat screen mounted in the trunk for the passengers that sit in the L-shaped lounge in the rear. The Expeditions feature a user-friendly control setup. All lighting, temperature, radio, DVD, CD, and television levels are wired to an LCD touch-screen system that is self-explanatory, making them very easy to use.